I hope everyone is having a lovely week and enjoying this autumn sunshine! 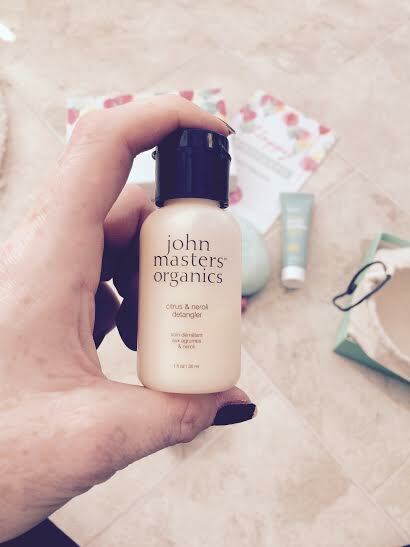 Now as you’ll all know from my previous posts, I need no excuse to have a good pamper session! 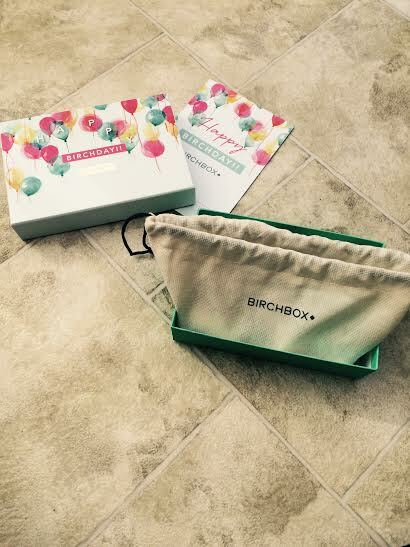 And I’ve recently stumbled across something many of you may have heard of called Birchbox. This is a monthly subscription to a beauty box full of product samples from cult brands as well as up and coming brands. 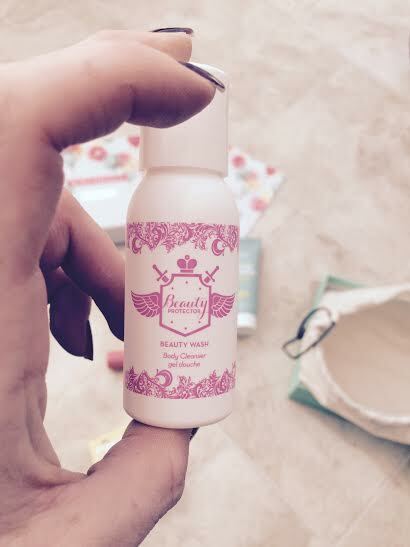 Samples can range from make up, skin care, bath and beauty, nail varnish and pretty much everything in-between! 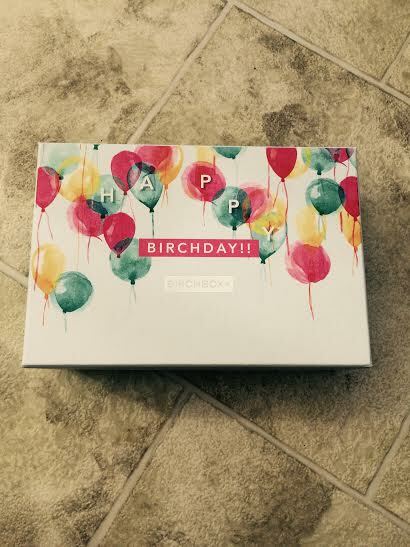 I’ve seen quite a few of these beauty box subscriptions about and have always been a bit wary as to whether they are worth the money or not but I got a great offer from Birchbox as it is their birthday month so I thought I’d give it a try. You can subscribe on a monthly or yearly basis, whichever suits you. A monthly subscription is £10 per month (+£2.95 p&p) and you also have the option of three monthly subscriptions (£30), six monthly subscriptions (£50) or a yearly subscription (£100). And if you need to, you have the option to cancel at any time. Each box is distributed on or around the 10th of every month and takes 3-5 working days to reach you. It’s lovely to get such a beautiful little package in the post each month and is something to look forward to! I have to say I am so glad I have given Birchbox a chance! One of the most impressive things, from my point of view, was that upon signing up you complete a personal profile on their website. This enables the company to send you products specifically tailored to you and your needs, rather than just sending everyone all the same samples. This is brilliant because you don’t end up with products you don’t need or wouldn’t use so you don’t have the feeling that you’ve wasted money. 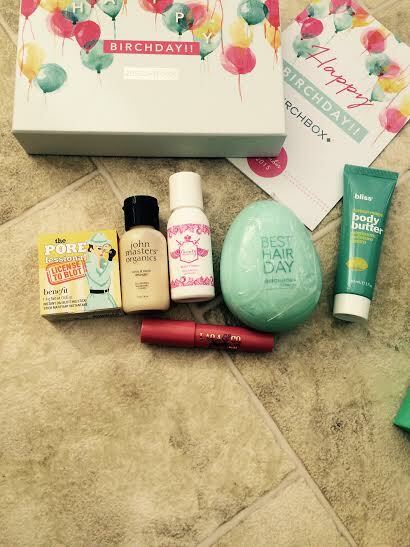 Each month there is a different theme to the boxes too, and in keeping with the birthday celebrations Birchbox’s September box had the theme of its’ home country, the USA. So all the products included hail from there. Past themes have included a “royal” box of goodies, celebrating the month in which Princess Charlotte was born, and a “Free Your Mind” box celebrating creativity and new products in health and beauty. So I thought I’d give you all a sneak peek of my first box! First of all I loved the presentation of the box – the design was one of two customer designs to celebrate Birchbox’s 5th birthday and inside the products are nicely laid out in a small duster bag (as pictured above). So the first products I received was a sample of Benefits The Porefessional. As all of you will know, Benefit is one of the largest and most successful beauty companies in the world and I am a huge fan, so I was thrilled to receive of this new product. 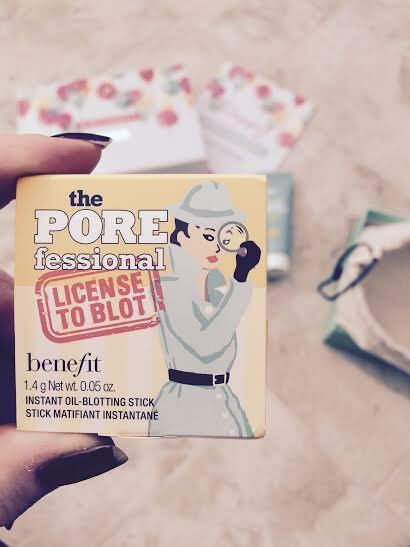 This clever little stick helps cover shiny and oily T Zones by using the stick to blot against the areas, mattifying shine for up to 6 hours. I have never suffered with oily skin until I fell pregnant so I’ll certainly be giving this a try. 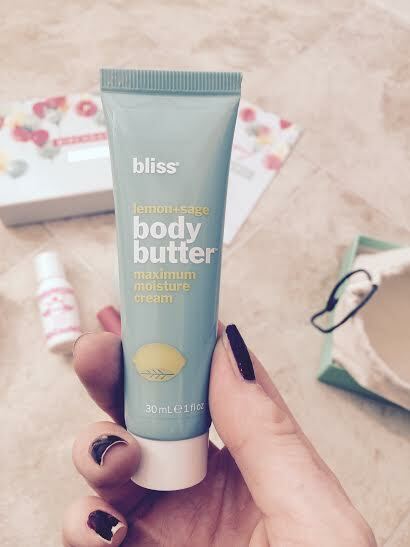 Next up was a tube of body butter by Bliss. I absolutely love Bliss products, but can rarely find them where I live so this is a real treat. Bliss is a hugely popular spa brand with a huge range of products. This body butter promises to soften any dry patches and contains coconut oil and vitamin E. However I’ve not tried it myself yet as it has sage included in it and there is still some confusion as to whether you can use this in pregnancy. In the mean time I am saving it for a nice pamper once baby is here. Now this brush, combined with the detangler, is a god send! This is a Birchbox exclusive and is a gorgeous little product. This magic little brush, AKA the “Birchbrush”, can work out even the most horrible of knots. Once you’ve given your hair a brush with this it is noticeably smoother, and I also used it when my hair was wet, normally a major no-no, after using the John Masters Detangler and it got through my hair so well! I am thrilled with this little gem and will certainly be adding it to my hospital toiletry bag for when I go into labour and don’t want to look like I’ve got a birds nest on my head after I’ve given birth!! Being pregnant, I’ve turned to long warm bubble baths to relax and have some time out, so this body wash is another perfectly timed treat. 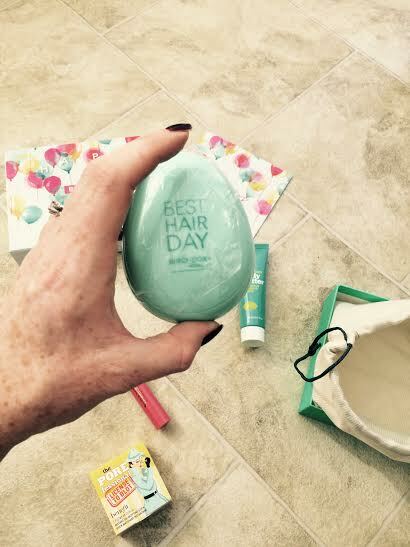 Another Birchbox exclusive, this is Beauty Protectors Beauty Wash and it smells absolutely gorgeous! I loved using it as the scent reminded me of being in a spa, and it’s got a really rich foaming texture so a little goes a long way and leaves you with lovely soft skin. 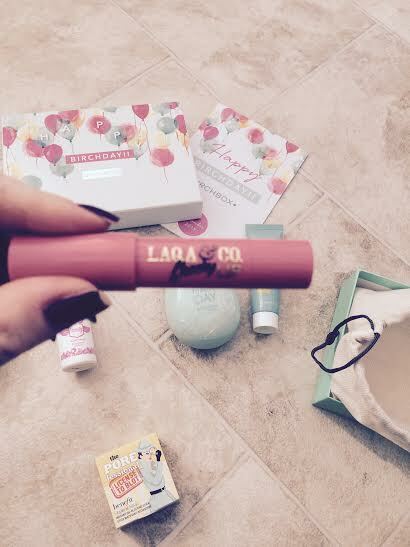 The final product of this months box was another Birchbox exclusive, and is a Laqa&Co Cheeky Lip Pencil (in shade Humble Brag). I have recently started using lip crayons and love them so I was really pleased to receive this and was pleasantly surprised to find the shade suited me perfectly (another bonus of completing a beauty profile on the Birchbox website upon signing up). I love the texture of this; it’s not heavy like lipstick can be and isn’t sticky as many lip glosses are. Having said that, it would make a great evening look with a slick of clear or very light pink gloss over it. And an added benefit of this is that you can use it to add a pop of colour to your cheeks, just blend it straight onto your skin with your fingers. So all in all I can honestly say I was thrilled with this box and I am so glad I’ve signed up. The customer service and information available by Birchbox is second to none, so if you want a little monthly treat I’d highly recommend this! I hope you’ve enjoyed this post – please leave any comments or questions below and I’ll be back again in a couple of days with this weeks pregnancy update! Previous Post Stop the epidural shaming!